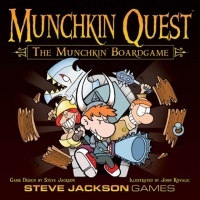 Steve Jackson Games will launch Munchkin Quest, a board game based on the successful card game, this fall. The game is designed by Steve Jackson, with illustrations by John Kovalic. Release was originally planned for Origins, but design changes to improve play have pushed the launch date back. The $49.95 big box game will include cards, tokens, tiles, gold pieces, monster standees, dice, a 20-page rulebook, and other choice bits. Munchkin Quest will be expandable; the first expansion is planned before the end of 2008. The Munchkin card game is a perennial Top 10 property in the ICv2 Top 10 Board, Card, and Family Games lists in the ICv2 Guide to Games. It accounted for over 70% of Steve Jackson Games’ sales in 2007.